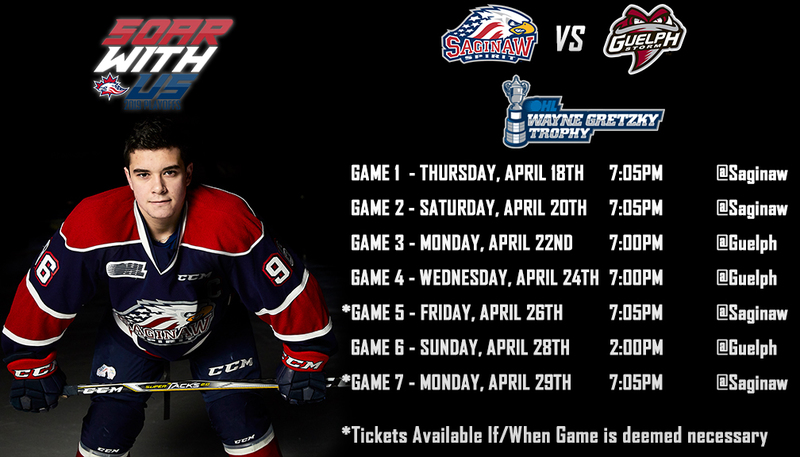 St. Catharines, ON – After a tough setback at home to the OHL West Division leader Sault Ste. 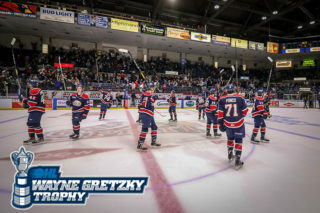 Marie Greyhounds on Saturday, the Saginaw Spirit look to get on the right foot in the first of a three-game road swing. In what was their first loss since finishing the Northern Ontario trip over the Thanksgiving weekend with five of a possible six points, the Spirit now head to the Meridian Centre in St. Catharines, Ontario, to visit the Niagara IceDogs at 7:00 p.m. 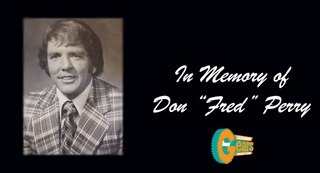 Listen live on the flagship WSGW FM Talk & Sports 100.5 and fmtalk1005.com with Joey Battaino and Dennis Desrosiers. 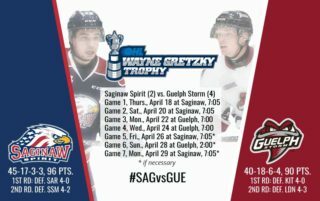 Pre-game coverage begins 15 minutes prior to puck drop at 6:45 p.m.
Thursday will mark the final of two regular-season meetings between Saginaw and the two-time OHL Eastern Conference champions. The Spirit fell in their first shootout loss of the year, 3-2, in the series opener on October 27 at The Dow Event Center. Through 27 games this season, the IceDogs are third in the Eastern Conference standings at 36 points. With 16 wins, seven losses and four overtime losses, Niagara sits only behind the Sudbury Wolves in the Central Division based on the head-to-head tiebreaker. Enjoying a three-game winning streak dating back to November 29, the IceDogs are coming off a decisive 5-1 contest on the road against the Hamilton Bulldogs, scoring twice in the first and third periods on 41 shots and going one-for-six on the power play. Saturday was the seventh road game in which Niagara has scored five or more goals this season, compiling a record of 6-2-2-0 in the last 10 games. The Spirit’s 7-4 loss on Superhero Night to the Greyhounds was the first for head coach Chris Lazary since earning the promotion before Thanksgiving after serving as an associate coach for the team for over two seasons. His debut at home last Thursday saw Saginaw escape past the Sarnia Sting by a 2-1 final. The win over Sarnia was the first in the six-game season series for the Spirit and will host the OHL West Divison rival again next Saturday, December 15, on Teddy Bear Toss Night, before wrapping up the year with back-to-back visits to the Progressive Auto Sales Arena. Saginaw continues to maintain a firm hold on fifth place in the Western Conference standings and second in the West with 31 points. Just one point ahead of the Windsor Spitfires and 10 behind Sault Ste. Marie, the Spirit have finished 5-4-1-0 since November 10. It was announced on Monday by the New York Islanders that defenseman Bode Wilde agreed to terms on a three-year, entry-level deal. Taken in the second round, 41st overall in the 2018 NHL Draft, Wilde is the latest of Spirit players to land his first professional contract. The native of Plymouth, Michigan has recorded 22 points on five goals and 17 assists since joining the team at the beginning of the season, which ranks eighth among all OHL blueliners and first for the Spirit. Wilde was credited on one assist in each of the last two games, scoring the game-winning goal in overtime at North Bay on November 22 to finish with three points for a season-high. Allowing seven goals to the Greyhounds would be Arizona Coyotes goaltending prospect Ivan Prosvetov’s first loss since stopping 87-of-88 shots in his previous two appearances in net, making an OHL career-high 48 saves on November 25 for the shutout win over the Attack. Picking up his second shutout this season to tie Mack Guzda of Owen Sound and Peterborough’s Hunter Jones for the most among all league goaltenders, Porsvetov has won 11 games since being taken in the first round of the 2018 OHL Import Draft, posting a goals against average (GAA) of 3.31 and a .894 save percentage (SAV%). 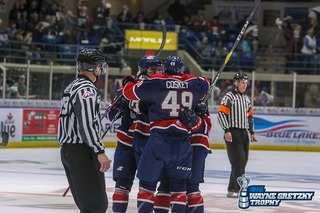 Veteran Cole Coskey earned second-star honors for his two-goal outing against the Soo, joining four other Spirit players in double-digit scoring. The fourth-year forward out of Zion, Illinois, leads the team in points with 27 on 11 goals and 16 assists. Wednesday, it was announced Coskey was selected to Team USA’s World Junior Selection Camp that will take place in Everett, Wash. Dec. 15-17. Grabbing the go-ahead goal at 11:03 in the first period for his second of the year was 17-year-old Camaryn Baber while 2018 Islanders fifth rounder Blade Jenkins ended Sault Ste. Marie’s four-goal unanswered run with 6:25 left in the final frame for his first goal since November 14. Ranked second in goals and third in points among all OHL rookies this season, forward Cole Perfetti continues to top the Spirit in scoring with 12 goals despite missing five games in the early part of November for the 2018 World Under-17 Hockey Challenge. The 16-year-old notched the game-winner against Sarnia in the early going of the third period after scoring twice in the Northern Ontario trip. Jake Goldowski tallied the opening goal last Thursday at 9:24 in the first period for his second in back-to-back games. The second-year forward and former Penn State commit has scored three times since November 17. Minnesota Wild prospect Damien Giroux still has the highest plus-minus rating of +6 among all Spirit players and is tied with Coskey in goals scored. On special teams, Saginaw has allowed just 88 man-up opportunities to opposing clubs which is second best in the league. It’s success rate on the penalty kill is eighth overall at 81.8 percent. The power play for the Spirit is 15th with 20 goals on 116 chances. 2017 Dallas Stars second round pick Jason Robertson ranks second in the OHL in both points (52) and goals (27), as well as first in power play goals (10), one-of-two players to surpass the 50-mark in points heading into Thursday alongside Sault Ste. Marie’s Morgan Frost. Forward Kirill Maksimov is one goal behind Robertson for second in the league in power play goals. Selected in the fifth round of the 2017 draft by the Edmonton Oilers, Maksimov also has the second-most penalty minutes (52) behind Daniel Walker of the North Bay Battalion. Robertson and Vegas Golden Knights prospect Ben Jones have combined for eight insurance goals while Stephen Dhillon is fifth among all league goaltenders in wins (13). Dhillon has compiled has goals against average (GAA) of 2.73 and a .916 save percentage (SAV%). The IceDogs recently announced the trade of third-year goaltender Colton Incze to the Spitfires on Tuesday in exchange for a fourth round pick in 2022. Incze was drafted by Niagara in the fifth round in 2015. On special teams, Niagara has the eighth best power play with 26 goals for a 20.8 percent success rate. The IceDogs are 18th in penalty killing, allowing 25 goals on 104 man-down situations. There will be a combined 13 players on the ice Thursday with their rights owned by NHL teams. For the IceDogs, it’ll be defensemen Jacob Paquette (Nashville) and Daniel Bukac (Boston), along with forwards Akil Thomas (Los Angeles), Ivan Lodnia (Minnesota), Jones (Vegas), Maksimov (Edmonton) and Robertson (Dallas). Defenseman Reilly Webb (Detroit), forward Brady Gilmour (Detroit), Jenkins (NY Islanders), Wilde (NY Islanders), Giroux (Minnesota) and Prosvetov (Arizona) will represent Saginaw. The Spirit will head south of the border to Erie, Pennsylvania on Saturday, December 8, for a 7:00 p.m. puck drop against the Otters. 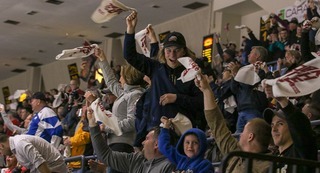 Saginaw won the first meeting at the Erie Insurance Arena, 4-3, on October 6 to begin the four-game season series.